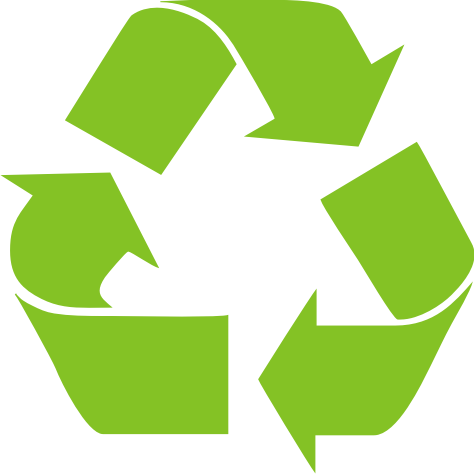 A superior method of decoupling plasterboard walls and ceilings with a recycled system that is impossible to install incorrectly so top performance is ensured every time the product is used. 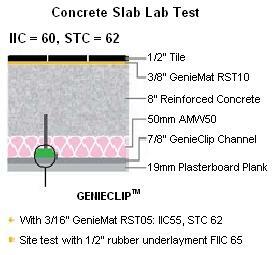 Recycled from used vehicle tyres the GenieClip vibration absorbing system can be used on timber studs for walls and ceilings. Allowing the new surface to be more efficiently isolated from the substrate therefore dramatically improving the sound insulation of the structure. 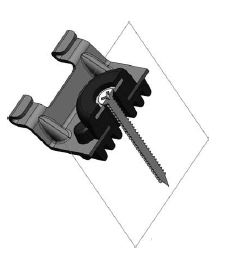 Because the GenieClip is impossible to install incorrectly it is extremely easy to fit and comprises the GenieClip which is screwed to the frame of underside of joists and with a top hat type furring channel is then clipped into it. There is nothing else to it. Once the GenieClip and channel system have been fitted, acoustic plasterboard can then be screwed directly to the channel with no risk of short circuiting through to the supporting frame of joist. 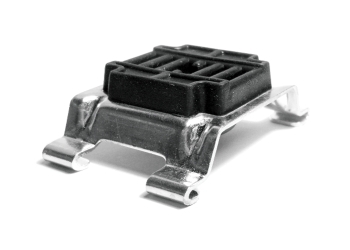 Resilient Bars are often installed incorrectly whereas the GenieClip system is impossible to short circuit. 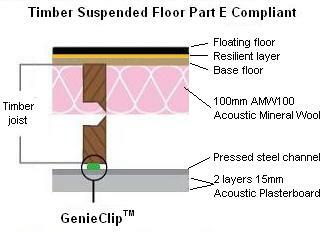 GenieClips are the best choice when soundproofing ceilings and can be used to help bring the structure into Part E compliance within flats. 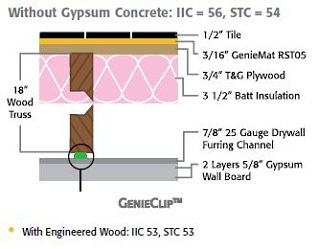 When used along with other sound insulation to soundproof a separating floor, GenieClips in the ceiling creates an effective acoustic decoupling between the joist and finished ceiling. If access to the underside of the joists is not possible the GenieClip system can be screwed directly to the underside of the existing ceiling or for a better result, supported on 50mm battens infilled with AMW50 acoustic mineral wool. Again, for best results the soundproofing of the acoustic plasterboard can be improved when our SoundBlocker Acoustic Membrane is sandwiched between the layers. Using the 50mm batten system on existing ceilings, best results are achieved using our SoundBlocker Acoustic Quilt instead of the more normal mineral wool as the acoustic infill. When installed directly beneath existing ceilings using AMW50 and 30mm of acoustic plasterboard, reduction in airborne and impact noise is normally more than 300% and can be further improved using SoundBlocker Acoustic Membrane as previously mentioned. 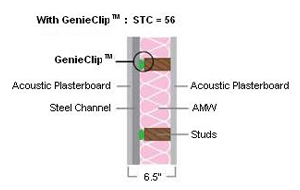 The GenieClip system is recommended when soundproofing any wall to help reduce the loud music being played or bass noise from music being heard through the wall. 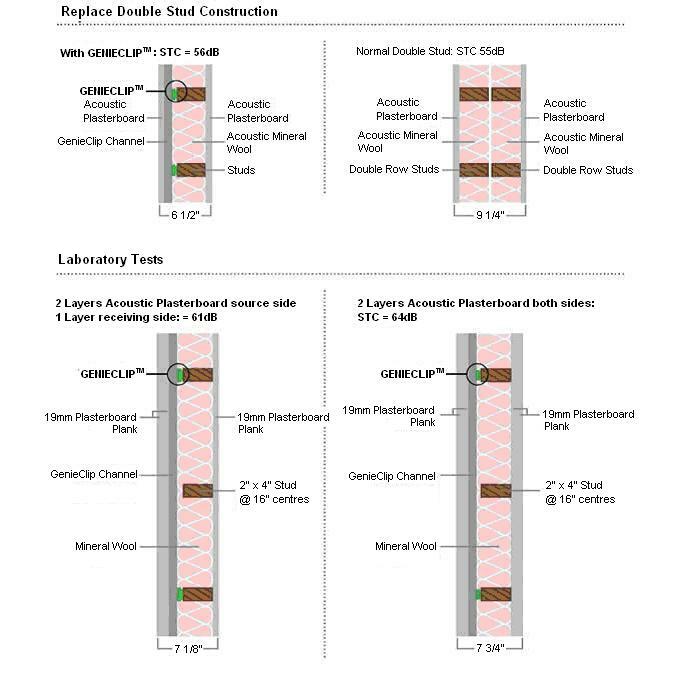 For best results when upgrading the soundproofing of a masonry wall is to fix timber stud directly to the wall before infilling with the chosen cavity fill of either acoustic mineral wool or SoundBlocker Quilt and isolating the plasterboard surface using GenieClips. However, if fitting an independent stud wall system at least 25mm away from any masonry wall, GenieClips would not be required. 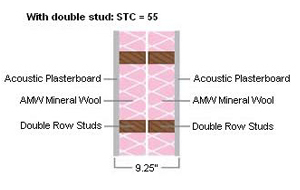 Our SBM5 Soundproofing Mat can be used between the layers of acoustic plasterboard to give even greater acoustic insulation along with the GenieClip system when soundproofing stud walls. When screwing the plasterboard to the furring channels a small gap should be maintained around the edges where the new wall meets existing walls, floors and ceilings to ensure the new wall remains ‘floating’. The gap can be sealed with acoustic sealant prior to decorating. For more detailed installation information just click on the link to the Installation Guide near the top of this page.